This weekend on our long drive home from Florida to Ontario, we started our second day of driving with a hearty and healthy breakfast at Denny's in Lexington, KY.
We were really excited to try the new $4 breakfast sandwiches, which come with hashbrowns, and were so pleased to see a variety of options on the new $2 $4 $6 $8 menu - great for when you are traveling and need some quick options. 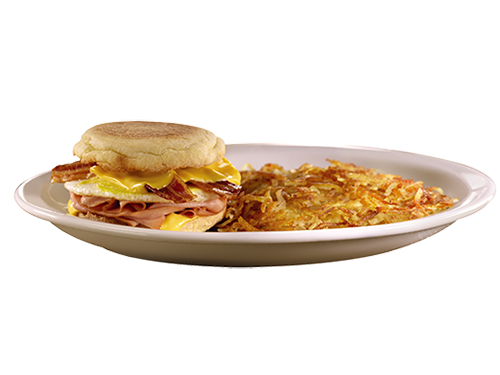 The standard $4 breakfast sandwich at Denny's is an egg cooked to order, two strips of bacon, shaved ham and American cheese on a toasted english muffin. We opted for the Fit Fare Breakfast Sandwich, which was loaded with baby spinach, egg whites, turkey bacon, tomato and pepper jack cheese, and came with a side of yogurt and berries, and a cup of fresh fruit. An awesome protein packed and healthy way to start your day! To say this Fit Fare meal at Denny's was filling was an understatement. The flavours were great, and ever last bite was finished. It was satisfying, and a meal that you won't feel bad about going out for. The best part was the value. A healthy breakfast under $7! In terms of the $2 $4 $6 $8 Menu, I was really pleased to see a large variety of options; really there is something for everyone. Not super hungry? Opt for the $2 pancakes! Stopping for lunch and want a great option? Get the Southwest Turkey Sandwich and cup of soup for $6! There are options for breakfast, lunch and dinner, which suited us perfectly for a quick no fuss breakfast while traveling. If you are looking for a great breakfast, with loads of value, when you are on the run, check out the new $4 Breakfast Sandwiches at a Denny's near you! Disclaimer: I was provided a gift card by Denny's to purchase our meal and write this review. All opinions expressed are my own.